Canoe. Hull cut from singletree. Raised tapered stern and overhang bow with cutwater. 6 thwarts. Outriger made fromboughs and branches bond together, bound to hll. Woven mating sail is tied to “V” form poles and lashed to thwarts. Steered by a single oar. 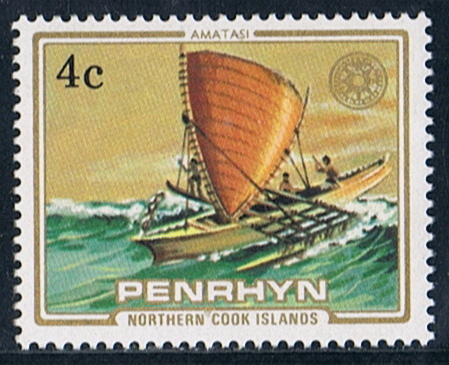 The AMATASI is used as a deep sea fishing and travelling canoe that became extinct toward the mid 19-th century. 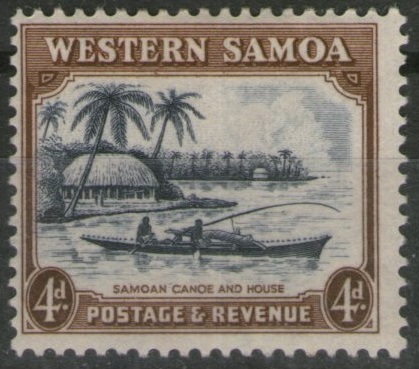 The canoe was used in the Samoa Islands and Central and Western Pacific. 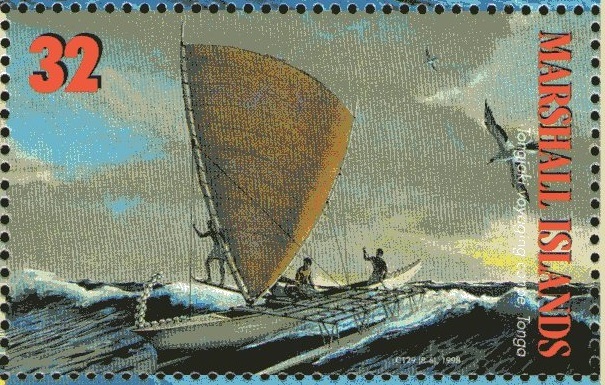 It was a very fast canoe, and often used to catch dolphins. Multipiece strakes added to the keel piece, sewn so that stitching showed only on the inside. The hull was U shaped in cross section, hull deepest near the bow. Raked concave stem, with gripe at forefoot. Stern elongated terminating in a small notched piece. Stem and stern were decked, tops decorated with a line of cowrie shells. Multiple outrigger booms lashed across the gunwales; long float, extended farther forward than aft; float and booms attached by divergent stanchions and lashings. The mast was stepped to a raised rim on the bottom of the canoe and lashed to the middle boom, she carried a triangle sail, with a spar along each sides. 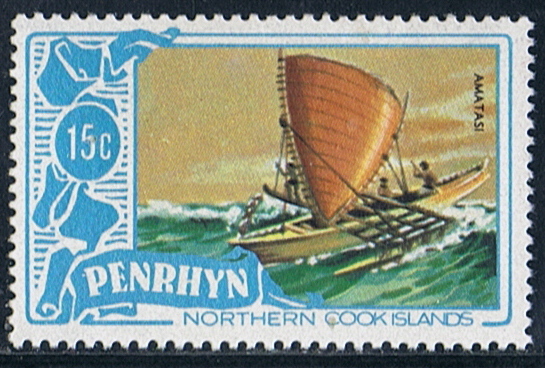 The apex of the sail was held back to the stern and during a tack the canoe made, the apex was swing around to the bow. The sail were made from woven pandanus leaves. Reported length 15 – 30 meters. Penrhyn Island 1981 1c sg166, scott?. 1984 4c sg338, scott? 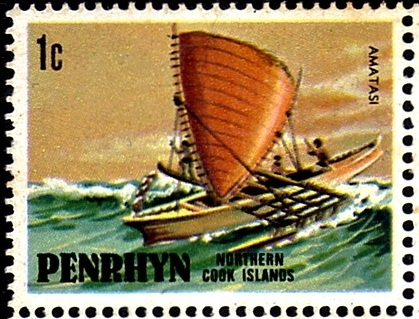 Penrhyn 1981, S.G.?, Scott: 130. 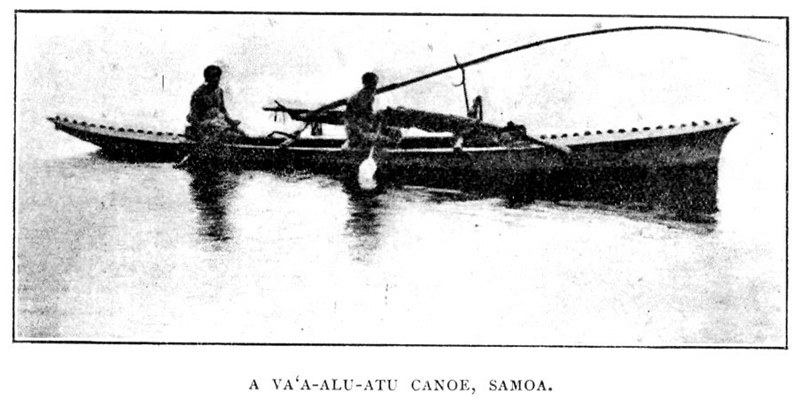 The amatasi was as a plank canoe with the typical flanged edges made like a bonito boat but larger and with three outrigger booms. The amatasi was very fast and was used in catching masimasi (dolphin) which were trolled for with a baited. The fore deck was decorated down the middle line with large white Ovula (marine shells) attached to a row of pegs. This part formed the seat of honor upon which the chief easily sat with safety. Short middle boom with 2 diagonal pieces of timber crossing diagonally from the hull to outer ends of the 2 outrigger booms.Above the crossed diagonals and below the outrigger booms,a number of spaced planks form a platform which reaches to the outer ends of the booms.The float is cut off square behind the attachments to the aft boom,but it does not project far forwards. Having both a prow and stern, these canoes cannot be manoevred without tacking; consequently the outrigger that constitutes their safety is, in using their sail alternately to leeward and windward, and does not, when to leeward, add much to the stability of the canoe. 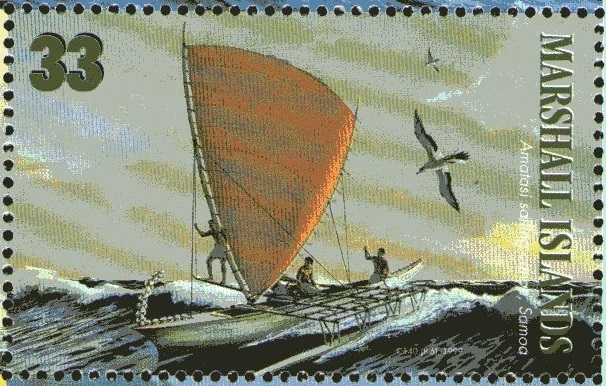 They carry less sail than the canoes of the other natives of Polynesia and to guard against the danger of upsetting, the natives rig a sprit or boom ( suati ) projecting from the opposite side to that on which the outrigger is fitted. The boom is secured with guys to the top of the mast. When the wind blows fresh, some of the men go out upon it and thus balance or counteract the force of the wind. Those on the other side of the canoe are kept ready to go out on the outrigger when that becomes necessary. The mast was stepped to a raised rim on the bottom of the hold and lashed to the middle boom. The triangular sail had a spar along each of the long sides. The apex of the sail was held back to the stern and on a tack, the apex was swung around to the bow. The sail is made of mat; some of these are ten feet high. Wilkes (42, vol. 2, p. 150) states that the longest canoes were 30 to 60 feet in length. They had a deck fore and aft and could carry 10 to 12people. 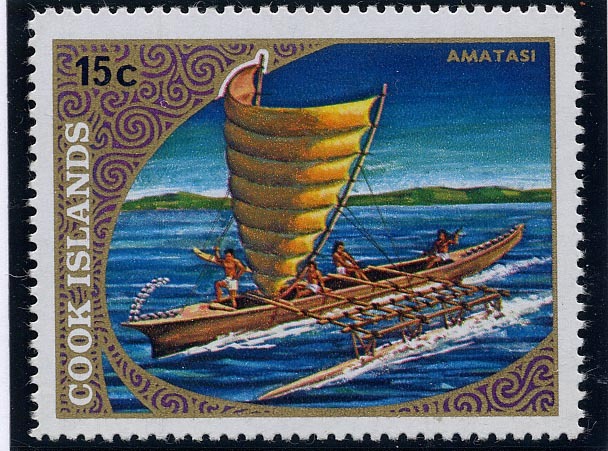 The stamp 32c in the title canoe "amatasi" written "tongiaki"-this is a mistake. Mr. Aukepalmhof, thank you for the information.